So, I've committed, gotten the time off, and made reservations for what is absolutely the most ambitious roadtrip I've ever taken. In late April next year, I'm flying to Sarajevo and spending three weeks on the road throughout the southern portion of eastern Europe. I'm flying into Sarajevo because for whatever reason the geographic restrictions on rental cars are the broadest I've seen anywhere. Sixt and Hertz of Sarajevo are the only rental agencies I can find that would allow one to drive up the eastern Adriatic coast. Zagreb is fairly lenient too, but disallows taking a rental car through Albania. "Austria, Bulgaria, Croatia, Czech Republic, Germany, Hungary, Italy (mainland), Macedonia, Montenegro, Romania, Serbia, Switzerland, Slovenia, Albania, Belgium, France, Greece (mainland), Luxembourg, Netherlands, Poland, Slovakia." I won't be visiting all those countries, of course- that's way too much to do in three weeks. I'll be focusing more in the Balkans/Romania/Bulgaria. For those keeping score at home, that involves visits to Bosnia, Croatia, Slovenia, Italy, Serbia, Romania, Bulgaria, Macedonia, Greece, Albania, and Montenegro. So...fairly grueling, but I'm okay with that. Looking at an average of a couple hundred km a day - the two longest days will be Split-Trieste at 509 km or so and Novi Sad-Satu Mare at 435 km or so. I'm comfortable with the idea that I probably, especially on those two days, won't have time to see 100% of everything I'd ever want to see. The idea would be to avoid motorways as much as possible, not that there's even that much of a choice through those areas. 1. I'm almost certainly not going to have a GPS with me, and though I'm going to write directions down in detail, I'd feel much more comfortable with a good road atlas. Any recommendations for a good road atlas/set of maps for that part of Europe? 2. Parking. I realize that taking a trip like this by car is unconventional (as evidenced by how few car hires will even allow such a thing! ), but I really want to have greater control as I navigate the countryside and not be 100% beholden to a bus schedule/etc. I'm comfortable with my ability to drive in ridiculous situations, drive a manual in the States already, and I'm good at squeezing cars into pretty small spaces. I'm not overly worried about smaller communities, but am wondering about trying to find good overnight parking in Sofia, Bucharest, and Tirane. In an effort to minimize costs, I'm trying to stay in hostels/b&bs, where I'd typically be relying on street parking/other options. Hotels with private parking aren't all that expensive in Sofia/Bucharest/Tirane - figure $50/night, so I could spring for those if need be, but if anybody has less expensive ideas on how to find generally safe parking in a random downtown eastern european city, I'm interested. 3. Languages. I'm feeling like if I'm driving overland, especially alone, it may behoove me to not entirely rely on English. I've been dabbling a bit with Romanian - my Spanish is okay and I took Latin many years ago, so it's coming pretty naturally. I'm thinking I probably also want to learn a bit of Serbian and be able to at least read the Cyrillic alphabet, if not understand it. I'm curious on thoughts there - with the idea that I don't have the capacity to learn 8 different languages in the next five months, are Romanian and Serbian probably the two that would provide the best bang for the buck given that itinerary? 4. Driving speed - I've generally been assuming about 55 km/h as an average driving speed in rural areas, trying to be conservative. I'm comfortable with a grueling pace, but I don't want to fall behind. Is 50-60 km/h a safe, conservative bet, or is that too high? Maybe I'll feel differently when I get into my rental 75 hp Dacia, but I'm comfortable driving/passing reasonably aggressively within the bounds of the law. 5. Vignettes - I see I'll definitely need to buy one in Romania and Bulgaria. If I avoid motorways, is it safe to get by without one in Slovenia? I think those are the only three countries with a vignette regime. 6. Borders - Assuming I have all paperwork in order (passport, car hire contract, whatever insurance proof), are those borders that are outside of the Schengen Area usually pretty much just stamp and wave through? Or is it more stressful, like the US-Canada border? Excluding airports, I think I'm going to be crossing through a controlled border 13 times. 7. Police - If I drive legally, will I likely get pulled over? Do I need to approach like Mexico and keep a very small amount of local currency on my person with the rest of cash stored somewhere else to, uh, take care of any issues? You may run across some border and internal checkpoints in some of the countries affected by the European Migrant Crisis. Around 50% of the population within the EU can speak some English. Some of the countries in the Balkan areas use (or roughly related to) Greek or Russian lettering rather than western letters (english, spanish, french, etc). I'm guessing the borders at this time will be something more like a US-Mexico (coming back into the US) experience due to the migrant issues. I believe the border between Hungary, Serbia, and Croatia was closed due to the crisis. You might want to see if those borders are open before you go. 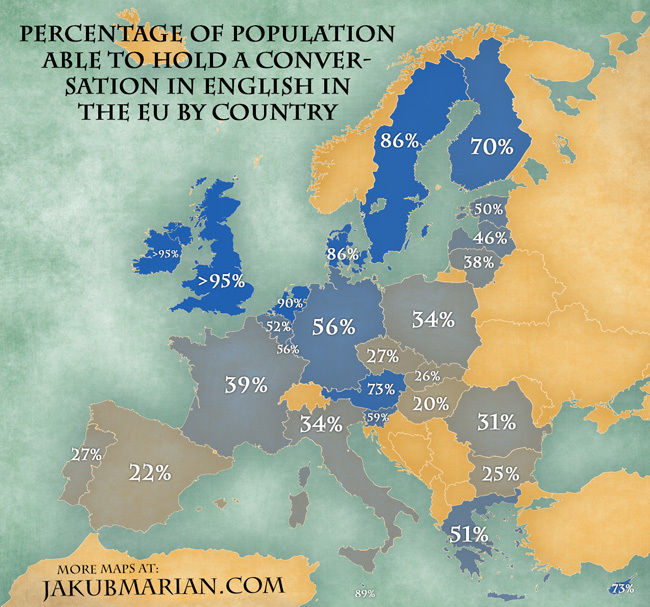 Around 50% of the population within the EU can speak some English. (Croatia weren't in it when this map was made). German would work in Hungary, Croatia and Slovenia if English doesn't. Albania is pretty Anglophonic, but Serbia, Macedonia and Montenegro aren't. Some of the countries in the Balkan areas use (or roughly related to) Greek or Russian lettering rather than western letters (english, spanish, french, etc). Serbia, Greece, Macedonia, Montenegro and Bulgaria. All the signs have Latin alphabet on. People said 'closed', but it was really 'not open, save the official checkpoints'. Hungary and Romania opened a cross-border motorway in the area and time period that Hungary were fencing off the border to stop illegal entry to Schengen. When I get time, I'll look at the Slovenia-Croatia-Bosnia map I have. It's fold-up, but the cartography is good, the brand is local, and maybe they have an atlas. Train stations? Airports might also be a good bet, and then get the bus into town. A bit of research ought to be helpful here - Google is your friend. 8 languages? BCSM, Slovene, Italian, Romanian, Bulgarian/Macedonian, Greek, Albanian is 7. Are you splitting BCSM by alphabet, or considering Macedonian and Bulgarian as different languages, rather than dialects of the same language? Serbian gives you the less familiar Cyrillic spellings and, given you'll transliterate back to Latin in your head, you'll be almost as good at Croatian and Bosnian. Montenegrin, is Serbian with some minor twists. Bulgarian and Macedonian aren't too dissimilar to BCSM, though you will have some issues. You will, however, be able to read a word out loud, which is a useful thing. Serbian and Romanian seem the right choices, given English/Spanish speaking abilities of various countries and your routings. Cyrillic, from my CHM experiences, isn't that bad, nor is Greek (and, while different, is similar). There's a few letters which look like Latin ones, but are different (Er (Cyrillic), Rho (Greek) and P (Latin) being the obvious one), and Cyrillic has a couple of letters that are very similar to each other in looks, but make different noises. It depends on hills, amount of villages traversed, and road quality. You'll have some issues that I wouldn't have (as I'm an EU-citizen, as much as I hate being so). Bosnian plates might cause issues, but not really - especially when you open you mouth and show your US passport (though parts of Serbia near Kosovo wouldn't be happy to see that), and more in the countries (Croatia and Slovenia) where bribes will be seen as more offensive than placatory. * To get an impression of road quality and thus a suitable average rate for point-to-point travel, I'd use StreetView (which is available for at least some of these countries) to collect visual samples for each rung of the road classification hierarchy in each country. My general impression, based on a driving tour I took of Ireland in 1999 when it had far fewer motorways than it does now, is that 50 km/h is a reasonable average. But many things can cause delay in rural areas: sheep on the road, etc. * All of these countries are emerging tourist destinations, so I would expect that to be factored in if you are stopped by the police. I have Swiss cousins who sail who called at the port of Bodrum in Turkey decades ago as part of an Ionian Sea trip. The Turkish port officials were very suspicious of them and initially wanted to subject them to a full-cavity search, but when my cousins asked them if they would like them to return to Switzerland and tell their friends all about this form of Turkish hospitality, they decided that part of the inspection would not be necessary. Thanks for the tips. I'm not overly concerned with the migrant crisis - I'll be an American in an empty rental car, so don't suspect I'll have added issues at borders. I don't really fit the profile of somebody involved in that. My two driving entries into Schengen will be at the Croatia/Slovenia border along the beach (a tourist path), and then from Macedonia into Greece, which should be off the migrant path (especially headed southbound). In fact, I think the way I have the trip laid out I won't be ever in an area that migrants are while traveling in the same direction as them. As planned now, I'll be crossing from Bosnia into Serbia and won't be entering Hungary, so that should be fine. That's obviously subject to change though as I refine the trip over the next few months. \When I get time, I'll look at the Slovenia-Croatia-Bosnia map I have. It's fold-up, but the cartography is good, the brand is local, and maybe they have an atlas. That would be awesome, let me know. I'm fine buying a collection of fold up maps - don't care if its an atlas or not, just need something by which to navigate. Are you splitting BCSM by alphabet, or considering Macedonian and Bulgarian as different languages, rather than dialects of the same language? Yes, was considering Macedonian and Bulgarian to be two different things. It looks like these are all visa free, so that is good. Many of these countries do require an international driving permit, which I find surprising, but I can get one of those. But yeah...I'll be honest, my big fear on this is some hassle with the rental car - either arriving in Sarajevo and them saying "wait, no, you can't take our car to these places, and it's not a matter of waiving the policy, we simply don't have the insurance to cover it" - all I can do is take them at their word that it's fine, and I called Bosnia to get that confirmation. Assuming that's not a problem...yeah, hoping I don't have border guards or whatever try to hoodwink me into buying insurance/paying other random fees. I'll be researching in detail before leaving. I'll take a look at those guides. The internet just doesn't have a lot of English language resources on some of these areas. I'm hoping that as I improve my Serbian/Romanian in the next months, I'll discover corners of the internet that have lots more useful information, or I won't and this will be even more of an adventure! I'm very much one of those people that like to plan things down to the minute in advance, so that I can use my time there as efficiently as possible and not use my time in Europe figuring out what to do in Europe, but I am seeing that some of that will be inevitable, and I am trying to allow for enough time for some level of spontaneity, but we'll see. I have a friend from Macedonia and he said Albanian is the most common language spoken in Macedonia. I'm sure you know this already, but most rental cars in Europe are manuals. If you want an automatic it usually costs twice as much. Yep, I drive a manual normally so not worried about it.